Let’s take a trip back in time to the 1980s and visit the type of city Charles Bronson would have cleaned up in no time at all; Wild Streets is the name of this online slot and it’s a feature-packed release from Red7 with free spins and graffiti in equally generous quantities. Wild Streets is a five reel slot with three rows and twenty fixed paylines; it’s the first time we’ve seen reels spin on a chain link fence down a grubby back alley but that’s what’s happening here – the neon lights of an arcade provide some respite from the gloom on the left hand side. The higher value symbols include the Wild Streets logo. the chap with the red beret, the girl with the purple mohican and the ghetto blaster; J, Q, K and A in graffiti style make up the lower values. The wild is written in graffiti on a wall and it will replace all others to help make winning combos except for the bonus and cash register symbols. Graffiti Wilds – a random number of wild symbols are sprayed onto the reels. Golden Cash Registers – land at least three on the reels and then pick one to award a prize of up to 500x the total stake. Jackpot Arcade – awarded when all the lights on the jackpot sign above the door are lit (it’s random); you’ll now get to choose tickets to try and three matching ones which will correspond to one of the four prizes above the reels. Subway Ticket Free Spins – awards twelve free spins with more spins awarded by landing tickets on reels one, three and five. Wanted level Free Spins – awards ten free spins with a ‘wandering wild’ replacing the standard wild; as more wandering wilds land (nine are possible), extra spins are awarded. Back Alley Cash – receive one to three dice rolls to progress along the trail to win multiplier values; reach the Big Win Truck to spin a wheel which can award up to 1000x the total stake. Cash Prize – it’s a cash prize! When the feature is first chosen you’ll have the chance to gamble it for a better one – but you may end up with a worse one so take care. 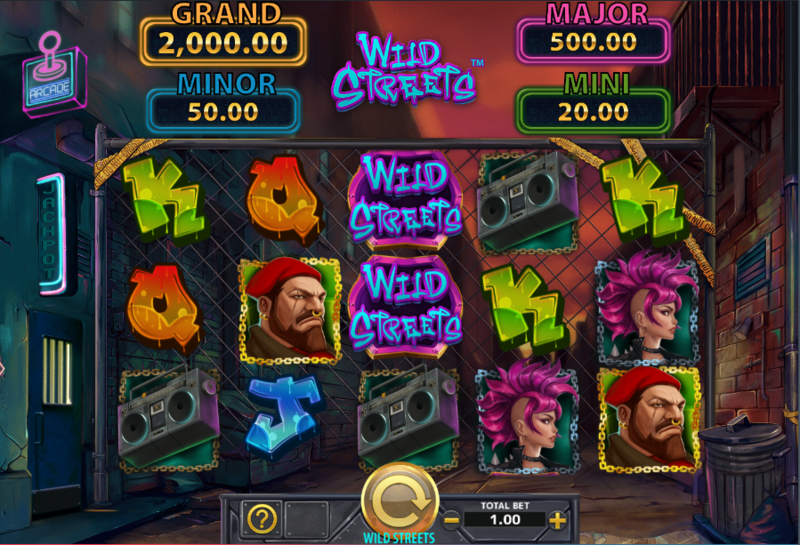 Wild Streets is a slot which packs about as many features into its reels as possible so once you get to grips with what’s going on it’s very entertaining; the music is contemporary 80s style to match the graphics and design and there’s an RTP of 95.90%.